It was during the 11th hour of the 11th day of the 11th month of 1918 that the guns of World War I were officially silenced. A Song More Silent is a beautiful commemeration of Remembrance (Armistice) Day. 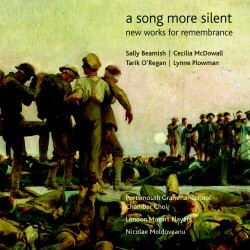 A song more silent features works by today�s leading crop of British choral composers, including world premieres by Tarik O�Regan, Sally Beamish and Lynne Plowman whose work Cries Like Silence is based on the E. E. Cummings poem �these children singing in stone� from which the title �a song more silent� is taken.